Peyton Manning is one of the greatest NFL Quarterbacks of all-time. Now that he won Super Bowl 50 and is also the NFL All-Time Career Leader in Passing Yards, Passing Touchdowns, Wins, and other key stats, Peyton Manning can (and should) retire and "go out on top". He is probably a guaranteed top-5, likely top-3, and arguable #1 of all-time. 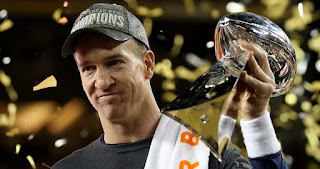 In fact, up until his loss to the Seattle Seahawks in Super Bowl XLVIII on February 2, 2014, Peyton Manning was considered by many to be the #1 quarterback of all-time. 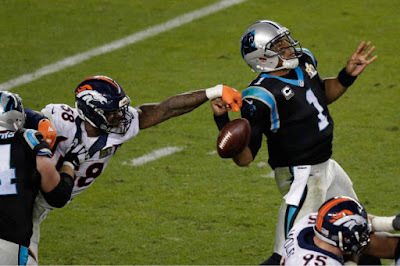 Losing again in the Super Bowl really made him look like a "choker" in the game it mattered most; some even called him the "best Regular-Season quarterback" because he was so terrible in the Playoffs. 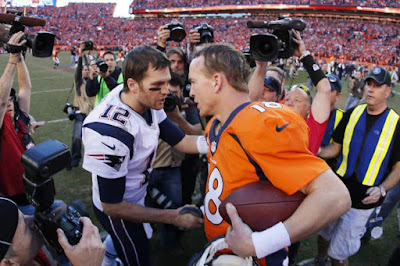 Moreover, losing again in the Super Bowl (1 out of 3 in his career to that point) still kept him so far from one of his biggest competition for #1 quarterback of all-time: Tom Brady, who had 3 career Super Bowl championships already. 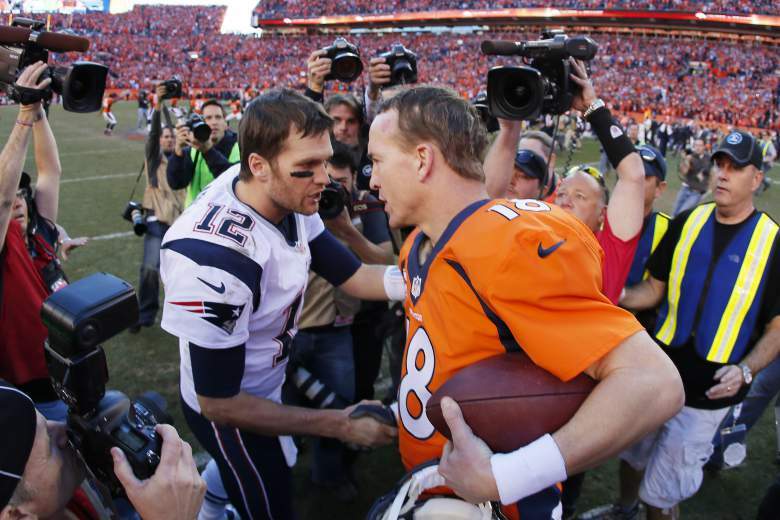 Brady and the New England Patriots added a 4th Super Bowl championship to that total in 2015, making it even worse for Manning's legacy. 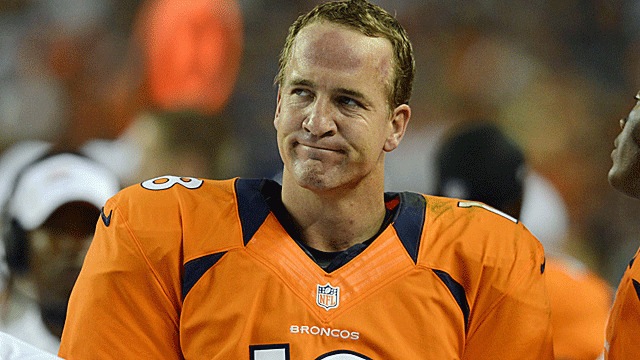 Suddenly, Peyton Manning looked like an all-time legend, but not the best ever. Not #1 of all-time. He was now injured, old, unlucky, and inefficient. For perhaps the first time in his glorious career, Peyton Manning was a bad quarterback (QB) choice. He threw 17 interceptions (INT) by Week 10! With only 9 Touchdowns (TD) in that span, and with an even worse 4-14 TD-INT count from Week 4 through Week 10, Peyton Manning was hurting his team. Ironically, even with his poor performance, the Broncos started the season 7-0. But eventually his struggles cost the team, losing two straight. 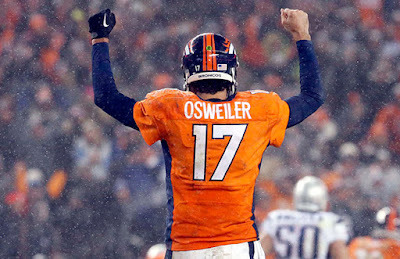 Osweiler had a very respectable 5-2 record. His completion percentage (CMP%) was decent, though volatile; He threw for at least 250 yards (YDS) 5 times; and he threw a lot fewer interceptions (INT)! If Manning didn't have a reliable backup QB to fill in while he recovered, perhaps he would have stayed in or come back early while still unhealthy. Manning might have continued his terrible season, thrown more interceptions, hurt himself further, and failed to make the Playoffs. BUT, instead, history was on the side of Peyton Manning this time. 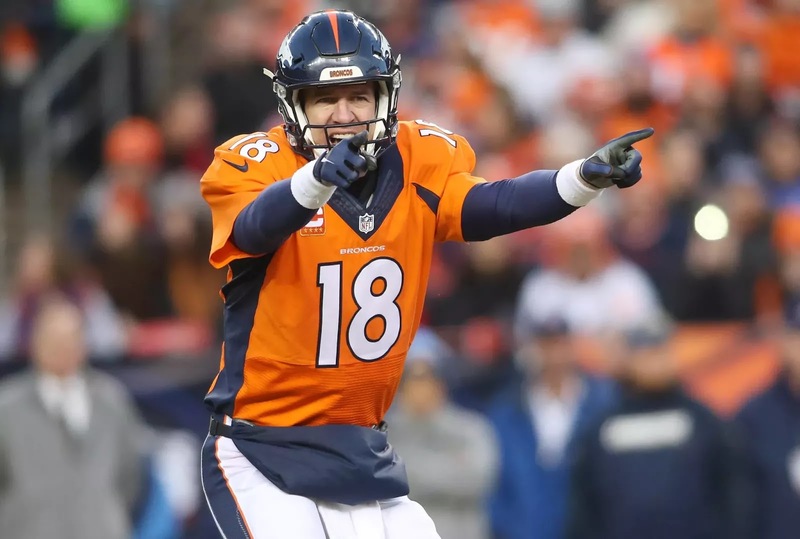 Manning was able to return for the Playoffs, fresher and with a better understanding of where he fits on this team. With a deteriorating body and a highly-weakened throwing arm, Peyton Manning was not likely to win games with the huge offensive prowess he was accustomed to. Instead, he accepted his role as the "game manager", just making sure he didn't screw it up for his league-leading #1 Defense (DEF). His Playoffs performance was weak, but he was successful in limiting the costly Turnovers (TO). Of course, his expert football mind and his lifetime of QB experience are extremely valuable yet impossible to truly quantify. Regardless of whether or not he deserves the credit for the Super Bowl win, his career stats now have him as a 2x Super Bowl Champion (2-2 in 4 appearances). His second Super Bowl win not only saved him from being labeled the ultimate failure in the Playoffs, but also 2 career Super Bowl wins now put him on-par with many of the other greatest quarterbacks of all-time. He will never match Tom Brady, Terry Bradshaw, Joe Montana (each with 4 championships) and probably won't catch up to Troy Aikman (3 championships), but his 2 Super Bowls finally put him on this same level of achievement as the all-time greats like John Elway, Bob Griese, Bart Starr, Ben Roethlisberger, and brother Eli Manning. Finally, some justification for his career. Finally, an essential addition to his achievements. Finally, some respect. Peyton Manning is way more than just his 2 Super Bowl wins, his legendary & expert football mind, his "Omaha" audibles, his TV commercials, and his giant status as hero in millions of people's lives. We must remember he is an individual and a human being. Perhaps football is so deeply ingrained in who he is and what he does that the two seem to overlap. It might also be too soon and too close to actually playing football that it's very hard to discern. Peyton Manning will go down in history as an all-time legend, a genius QB, a revolutionary in how Football is studied and played, and a likable guy highly-focused on the process of game preparation. 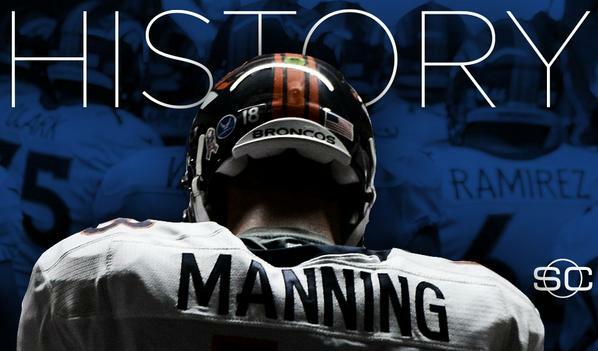 Peyton Manning is also going down in history as a record-setter, record-holder, and statistical all-time leader! Even if he didn't win a second Super Bowl, Peyton Manning's career stats are legendary. 1) #1 all-time in Passing Yards (YDS) - 71,940. 2) #1 all-time in Touchdown Passes (TD) - 539. 3) Tied #1 all-time in Regular-Season Wins (W) with Brett Favre. Peyton's 186-79 W-L Record compared to 186-112 for Hall-of-Famer Brett Favre has a significantly higher Winning Percentage (W%) of 70.19% vs. 62.42%. 4) First and currently Only player with 200 Career Wins (including Playoffs). 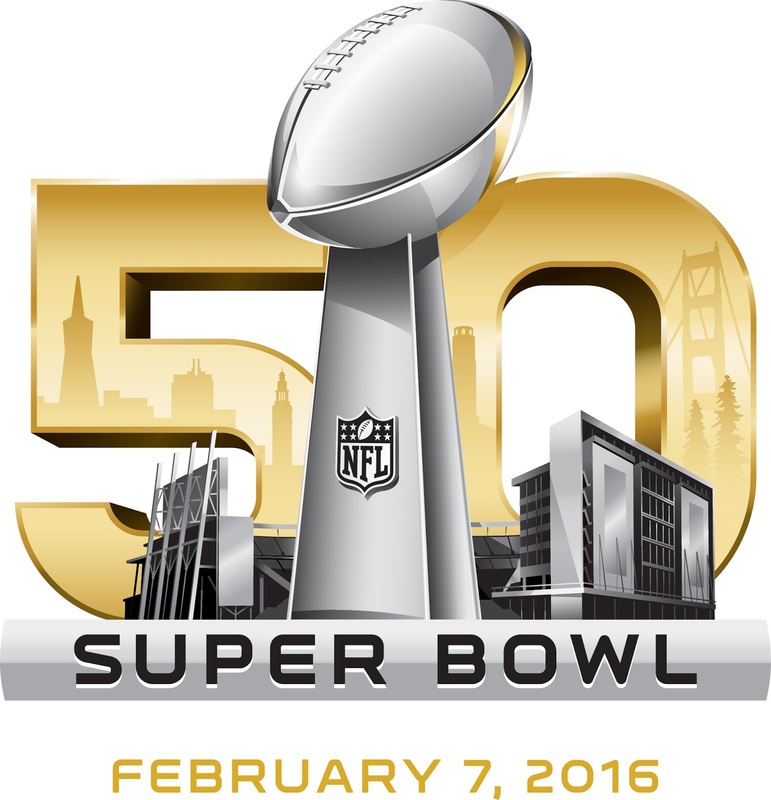 The win at Super Bowl 50 was his 200th. 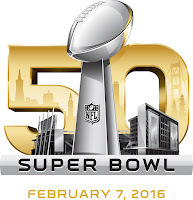 5) Only player to reach the Super Bowl with 4 different coaches. 6) #1 for Touchdown Passes (TD) in Season - 55. 7) #1 for Passings Yards (YDS) in Season - 5,477. --Prevents and/or Delays post-retirement opportunities to be a Football Analyst, Coach, Owner, etc. Peyton Manning was competing for the status as #1 QB as far back as High School. In high school, he led his team with a career 34-5 record. He was also named the Gatorade Circle of Champions National Player of the Year. 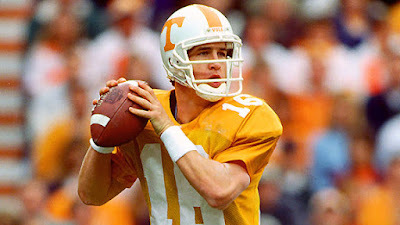 In college, Manning led his team (Tennessee Volunteers) with a 39-6 record. He broke the Southeastern Conference (SEC) record for career wins. He won the ESPY for Best College Player. He was awarded by the National Football Foundation as a National Scholar-Athlete. Let's be honest. He wasn't a good runner.